FUEL PRICES ARE at their highest level in 16 months, as new research shows that it cost €18 more for a month’s worth of petrol compared to this time last year. Research conducted by AA Ireland found that the cost of a litre of petrol is now at 136.3c. This is almost a 5c rise since last month, with the price of petrol now at its highest point since September 2015. The trend for diesel is much the same. 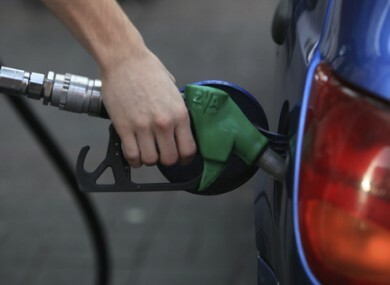 A litre of diesel now costs 126.9c, a rise of 5c from last month. The fuel is now at its most expensive since August, 2015. Using the AA’s fuel usage calculator, it now costs €205.45 for a month’s worth of petrol. This compares to €189.75 in January, 2015 – a difference of €16. With diesel, the owner of a similar car now pays €190.35 a month, compared to €169.20 last year – a difference €21. This consumption rate is based on a car that does 12,000 miles a year at a fuel consumption rate of 9.42 litres per 100 km. Commenting on the increase, Conor Faughnan, director of consumer affairs at AA Ireland, said that fuel prices were likely to continue to rise. “While it’s impossible to know what the long-term future holds when it comes to fuel prices, currently all the factors which inform prices are trending into the wrong direction for motorists,” he said. While international events can strongly influence the price of fuel, Faughnan points to Irish taxes as the main contributor to high fuel costs. Currently over 85c of the cost of a litre of petrol and 73c for a litre of diesel is due to tax. Faughan labelled these taxes as “excessive” and said that the high taxes “disproportionately impacts those without viable alternative travel options”. Email “Fuel prices rising: It costs €18 more a month to run your car compared to last year”. Feedback on “Fuel prices rising: It costs €18 more a month to run your car compared to last year”.